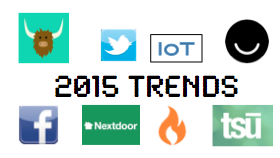 Time for everyone to weigh in on trends for the year. If there is one thing I have learned in this business, it’s that predicting the internet is like predicting the weather: You can use as many resources as you want to but you can only glimpse a fraction of the future, and once in a while you get hit by a storm no one saw coming – or an unexpected double rainbow. Half the predictions I have read for this year portray Google+ as the dark horse, and half suspect it will sink further into obscurity. Clearly this is not a science. This one is less of a guess and more of a view in to the business plans of several major players. Social networks want to be your single site for everything. Last year it was about the News Feed with LinkedIn Pulse and Facebook’s News making strides in that direction. Next year, social networks will make a move to take over our wallets. In September 2014, Twitter started testing out their ‘Buy Now’ feature where users are able to make purchases from Twitter directly when they see something they want in a tweet. Your credit card number would be stored by Twitter so no middle-man needed to make a sale. Facebook finally revealed their strategy behind the purchase of WhatsApp and the break-off of their Messenger app in 2014. It turns out Facebook is also making a play for the financial space where users will be able to seamlessly transfer money between one another within the Messenger App. Look for that in the early half of 2015. SoLoMo is shorthand for Social-Local-Mobile: applications that allow people to connect to other people and events that are in a local area. You can catch up on my blog on SoLoMo from earlier this year. These apps have become very popular and more keep on showing up. Examples of success in this space are NextDoor (neighbourhoods that post local news), Tinder (singles looking for matches within a short distance) and AllPaws (matches homeless pets to people in their area). Problematic examples include Yik Yak and After School (the latter new as of November 2014). Both these apps are targeted at students, college aged and high school respectively. These networks are anonymous but use GPS to connect to an audience in very close proximity. The idea is that you are speaking with your school’s student body. Unfortunately, the result is that you get a ‘bathroom wall’ effect where people are posting nasty messages about other students. Many schools have started to ban them. Filed under the ‘who would have thought?’ category, there is also Cuddlr. This SoLoMo app connects people who are not looking for dates but just want to cuddle. I’d rather see the next app be a cross-over of Cuddlr and AllPaws which gives you local dogs to cuddle rather than strangers. I come across at least 5 mentions of the IoT a week, and that’s likely because I am immersed in it. When I bring it up at speaking engagements, especially with kids, very few people know what it means. I suspect everyone will be familiar with the “Internet of Things” soon, but allow me to explain it first: It used to be that to ‘connect to the internet’ you needed a device with a browser, but this is no longer true. The Internet of Things is the network of all objects that connect to and through the internet without a browser: think Nest thermostats, car systems, Fitbits. Cisco currently predicts 25 billion devices will be connected by 2015 and 50 billion by 2020. The last 18 months has brought us the Edward Snowden revelations about the NSA spying, the iCloud leak of personal photos and the Facebook “mood study” that altered people’s news feeds to change their attitudes. Clearly the internet is not the trustworthy place people once believed it was. Though most sites and services read and use your data,Facebook still takes the bulk of the blame. I read up on at least a dozen ‘anti-Facebook’ network announcements this year. Each one was a better version of what people wanted from Facebook but feared they were not getting. Many having to do with privacy – from exclusive networks for millionaires to networks made of only private groups. Others having to do with the selling and transfer of your information. The two most notable in this space were Ello and Tsu. Ello promises not to sell any of your information to advertisers, where Tsu allows you to select which advertisers get your information and then you get a cut of their payout. I expect a lot more of these attempts to usurp the royalty of the social network world. The problem is that Facebook still has over a billion users so people will stay on it just because everyone else they want to connect to is there already. So despite the challengers, I don’t expect a de-throning any time soon. I am the first to advocate on the many positives in the latest technology and the ability to connect online, but I also believe you can have too much of a good thing. There were numerous studies released this year about the negative effects of being on social networks too much. From emotional issues to physical ones, apparently even our brains are actually being rewired as we scroll through feeds and pictures. Kids have developed addictions to both being connected and online gaming. I write about this one often because I personally believe in balance; Learning to limit time spent online while still maximizing the enjoyment of what social networks offer. As we head through the year, I look forward to seeing what new cool things the latest technology will deliver. What will be this year’s double rainbow?